So, while in SoCal at the end of last week, went up to the amazingly beautiful campus of Pepperdine University to see my friend Ken Canfield and then took some time to venture a little further up the Pacific Coast Highway to go see the neighborhood where Bob Dylan built his big, big house decades ago. Found it weeks ago, thanks to help from Google maps (satellite mode). However, drove around and knowing exactly where his house is, it was still difficult to find. You can’t get any glimpse of it from the road, totally cut off from any view or access due to all the surrounding, and much smaller houses. Interesting, that even though this is Malibu, the neighborhood looks as if it might really have been something in the 70s. But it is older and in some parts a little run down. But like an old pair of slippers that you wouldn’t trade for the world. Quirky and cool. The neighborhood even has some undeveloped fields just sitting dormant, seemingly abandoned. Found an old black bible in one of these fields, looking like it belonged to and was lost by a passing-through homeless dude. It had a two xeroxed copies of Elliot Ness’ passport photo page in it. Serious! It had business cards from like six different churches from all around the SoCal area in it. Not being mine, I placed it on the hood of an abandoned sun-faded blue Volvo sedan sitting in the field. The only connection to said property was this very dirt road that looked like it led into a junk yard. Who would ever think such a scene would be the entrance to Dylan’s house? Which is what makes it such a brilliant entrance to his house. So here is how I play it. I’m just a guy out driving on a beautiful Friday afternoon eating a smoked turkey sub. I don’t know where I’m going. I pull into this one road that looks like it leads to a junk yard to turn around. As soon as I do, this young guy steps out of this little elevated hut/house (which you can see down the road in this picture) and starts walking toward to me. I swing around so he can walk up to my driver side window. His demeanor is intentional, but relaxed. I tell him I am just driving around looking at the old houses and needed to turn around. He says that’s cool. 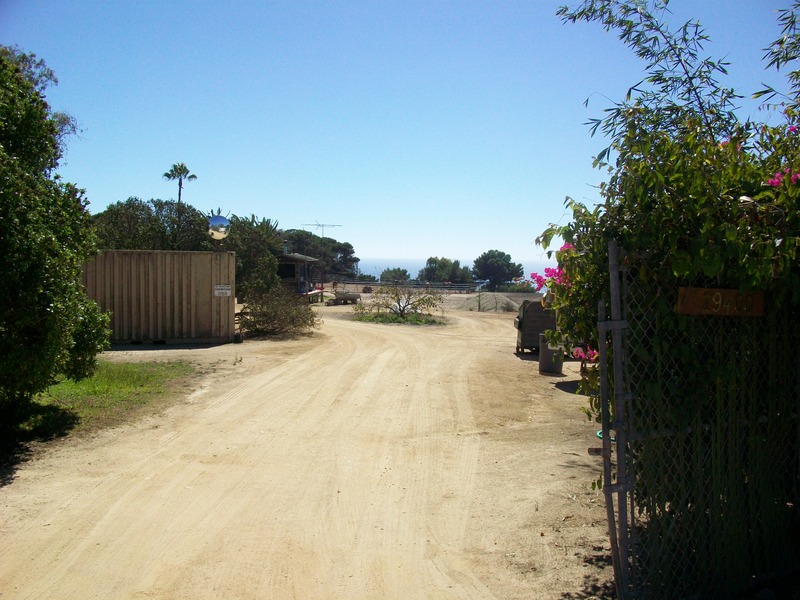 So I ask what this curious piece of property is…some large field in Malibu with storage containers, junked cars, horse stalls, etc. He asks me my name and tell him “Glenn”. He warmly shakes my hand and tells me his name. He says to me, “I watch this property for a man who lives here. I watch over the place and take care of his horses. He’s gone most of the time.” We talk about the nature of the neighborhood, its curious rough-and-tumble state-of-being and he kindly directs to me some other parts of Malibu that he thinks I might find interesting, Mulholland Drive and all that. What’s cool, is in the distance, I can see this very car. Some years ago, Newsweek did a cover story on Dylan upon the release of Chronicles, the first volume of his autobiography. In that spread was this very curious photo with the caption, “Dylan, at his home in California”. 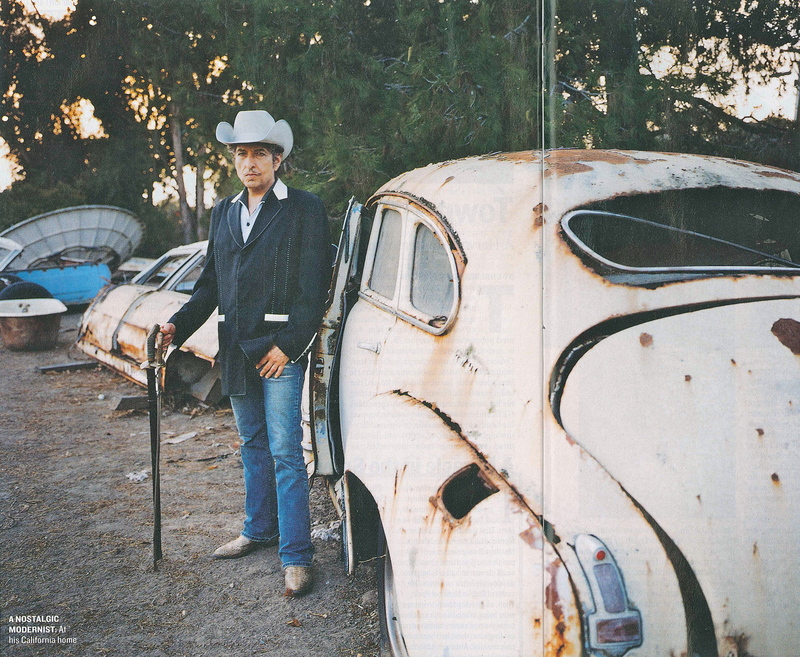 I remember thinking at the time, “Bob Dylan lives in a junkyard?” Well, apparently he does. A very big junk yard in Malibu. There’s Mr. Dylan, transcending the categories. While driving back to LA down the PCH, I thought I should have told my new friend I enjoy photographing old cars and could I go grab a shot of that white bomb before us. As nice as he was, he probably would have. But maybe not. Anyway, it was a fun, funky little jaunt for a beautiful afternoon. But it made me 90 minutes late for what was a delightful dinner at my sister’s house in Irvine. Its a sticking place .please pull the plug. seriously bob what the hell are you eating.ill never make another trip there -without a gas mask. maybe you need guitar lessons. Just because he leaves his gate open, gives no one the right to drive through there without his permission. We have passed by there many times, and NEVER went anywhere near Mr. Dylan’s property. Shame on you for doing that!!!! Nosey!!!! So which is it? You’ve “passed by there many times” or have “NEVER went anywhere near” there? Birdview and Bluewater St. we were always “street side” Never on private property!!! Have a great pic of that car in Bobs backyard (without Bob). Was there few years ago. When my mom and I were on vacation in Malibu in 2006 we drove by the house and saw Bob walking two of his dogs in the yard. isn’t it just crazy curious that that’s his yard? but if he weren’t so funky, he wouldn’t be bob! and the wonder of google earth, uh? God bless Bob Dylan. Wow how great no bureaucrats have tried to make him comply with their views. Yea Bob! He’s a sculpter of metal. His pallette lies all over the ground. Good to know it.